And, so, when I found this dish on the menu at a restaurant (Catfish Corner) here in my hometown of Abilene, Texas, what could I do but order a plateful for myself? After all, being a member of the media, I recognize my duty to serve my public’s right to know. Not every restaurant serves up a dish like this. Chicken-fried bacon, not to be confused with Bacon Explosion (itself a 5,000-calorie dish), is real, is totally Texan, and is served with ranch dressing on the side (some places accompany it with cream gravy). Chocolate-covered Bacon, meanwhile, is a dessert dish, sort of. I didn’t have it with my chicken-fried entrée. (If I had, I might not be in shape to write about it, or anything else, right now.) 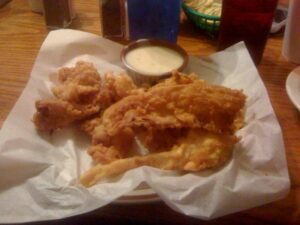 But I’d have to say that chicken-fried bacon ranks as perhaps the most fat-saturated dish I have ever consumed. I heard once that Coldstone Creamery makes (or made?) a milkshake that has the fat equivalent of 63 (!) slices of bacon. Maybe that dish would be more artery-clogging than the one I had. But I don’t think I’m going to go to those lengths to find out. 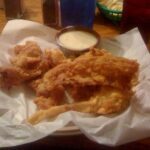 It was a Texan, Frank Sodolak, a culinary artist (if I might call him that) who reputedly invented chicken-fried bacon. He put it on the menu at his Snook, Texas-based eating establishment, known as Sodolak’s Original Country Inn. In 2001, the place caught fire. The Austin American-Stateman carried an article (title: “Grease: It’s not just a food; it’s a way of life”) wherein John Kelso wrote that “Fans of chicken-fried bacon will be happy to learn that Sodolak’s Original Country Inn should be re-opened by mid-July after being totaled by fire in February.” At the time, Sodolak said that either a flare-up on the charbroiler or a grease fire was responsible. Hard to swallow? Depends on what you think of Texas, and Texas cooking.